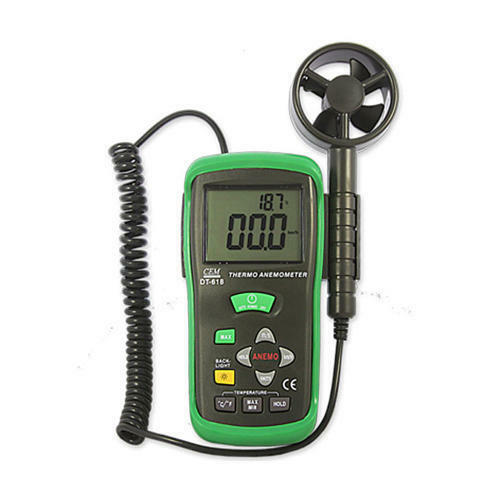 We are offering our clients a wide assortment of Digital Anemometers (Air velocity Meter) that are widely appreciated by the clients due to their durability, reliability, easy handling and low maintenance. Our range is procured from the trustworthy manufacturers like Lutron, Eurolab, HTC, TPI, Prova etc. who make it using premium raw material to ensure quality. Moreover, we pack all the products using premium packaging material to ensure safety and security during transportation. We, A. Kumar & Company, established in 1975. We are a prominent name in manufacturing, wholesaling, distributing, trading and exporting a superior range of Scientific and Analytical Laboratory Instruments. This range includes Antibiotic Zone Reader, Vertical Autoclave, Biological Safety Cabinets, B.O.D Incubator, Bulk Density Test Apparatus and Bunsen Burner Electric, to name a few. In addition to this, we offer Constant Temp. Water Bath, Environmental Test Camber, Hot Air Oven, Hot Plate, Bacteriological Incubator and Laboratory And Scientific, amongst few. The offered range is developed using superior grade stainless steel, mild steel, aluminum and EPOXY powder coat material, sourced from reliable vendors of the market. This range is widely admired among the respectable clients, owing to its accurate composition, accurate measurement, superior performance, precise pH value and high efficiency. Our personnel ensure to offer this range in different custom-designs, so as to append and respond to the diverse demands of clients. We have been able to come up with a sprawling infrastructure (spread over 800 square feet), which aids us in handling the business related activities. The premise is suitably equipped with highly advanced machines and other essential amenities. In addition to this, a competent team of innovative and skilled professionals is appointed by us, for the appropriate management of all the functionality of our business. The professionals appointed by us ensure to work in synchronization among each other, in order to fulfill the prime objectives of our firm. Owing to the transparent business dealings relentless efforts of our employees and sophisticated manufacturing facilities, we have been able to serve prestigious clients such as Steel Industry Casting Rolling Mill, Pharma Company water Treatment, ETP, Sugar Industries and allied.